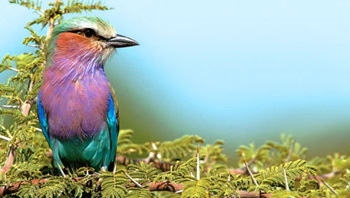 There is no doubt that the most colourful bird in our region is the Lilac-breasted Roller. The bird is easily noticed not only by its visual splendour but also by its raucous call. To make it still more noticeable, the Roller does some great physical exhibitionist displays. In fact, it gets its name from its flying action. The Roller will take noisily to the air, flying upwards and at its desired zenith, it shoots downwards “rolling” side-to-side. The Afrikaans name is Troupand. The meaning of “trou” is “marry” and the name derives from the ancient tradition of bridegrooms giving the Lilac-breasted Roller’s beautiful feathers to their prospective wives ! And the best I have done recently is to give Sandra a feather of only a Crested Guineafowl seen in the Umhlanga Nature Reserve. 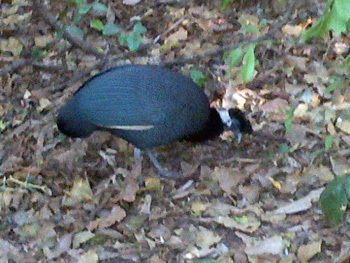 The Crested Guineafowl is very rare in Kruger Park, occurring only in the far north along the Pafuri river. On the other hand, the Helmeted Guineafowl is common throughout South Africa and a flock is seen daily at the Tremisana waterhole. In June we were visited by a number of student groups. What makes me happy is that the groups visit us every year to keep the good work of helping the local communities. Sadly Mr John said goodbye to us – it was his last trip. I will miss him so much, after working with him for so many years. Our first group was Mitty High School from USA California. There were fourteen girls, fifteen boys and five teachers, in total 34 guests. They work mainly with Catholic institutions. On the first day we did a sunset drive and the next day we went to Kruger National Park for the day. The next day we visited Funjwa primary school and the Catholic Church in Acornhoek. 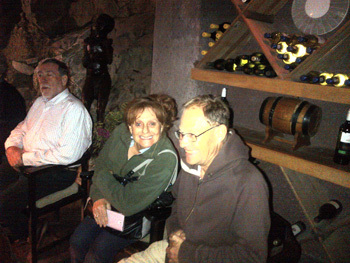 Our guests were happy to socialize with our local communities. We left the lodge early in the morning travelling to Acornhoek village where the church is situated. We were accompanied by one of the Viva Safaris management Trevor Zeegers. He also helped us to paint. Everyone was working very hard and willing to help the poor people. We were divided into five groups, all five groups had one of the big five names. Most of the students were painting walls while the rest were cleaning the walls before the painting. When we left, the building was completely changed. After hard work we arranged a soccer match us usual. Many students were given an opportunity to play in the match. Isaac, Wesley and Thabo played as well. It was a good match and we won the game Mitty (02), Acornhoek team (01). Same score like last year, but different teams. Kruger did not disappoint – our first sighting was two big male lions following a group of buffaloes. They crossed the road on front of our Cruiser. One buffalo stopped and looked back, but it did not see anything. It kept on grazing and moved forward to join the rest of the group. We lost sight of the lions because they went into the bush. Our second sighting was elephants taking a bath at Nsemani dam – we spent an hour watching them and lots of general game that came to drink water. On the main road towards Satara we spotted five rhinos from a distance and one the students managed to take clear pictures. We continued driving and we found a mother and a baby rhino walking along the road .We followed them for half an hour. It was one of the best sightings that day and very enjoyable. We had a good leopard sighting as well so completed the Big Five ! The second group was Long Beach University from USA California. There were nine girls, one boy and a professor, Miss Pamela or Nduna. She has visited Viva Safaris for nine years in a row and she always asks for me to be their guide. They help Funjwa Primary School . They teach the children how to write, read and speak English and they also play games with the children. They donated stationery and a laptop to the children. After our interaction with the school, we visited Acornhoek orphanage . Our presence was highly appreciated and everyone was happy..
On the 15th of June I did a morning bushwalk at Marc’s Camp. We saw some giraffe walking on the road towards us. We decided to take the other way so that we could be able to get close to them. We managed to get as close as thirty meters walking in the bush. The guests were very excited and managed to get very good pictures. We also managed to see quite a few birds that morning. I left the lodge after 8am and conducted a safari in Kruger National Park for the rest of the day. On the Orpen road to Satara most of the surrounding vegetation was burnt making sighting animals clearer. We managed to see general game such as impala,, giraffes, zebras. In the late morning, game viewing improved : we saw three of the big five within a space of thirty minutes. The first one we saw was a rhino that was approximately a hundred metres away. 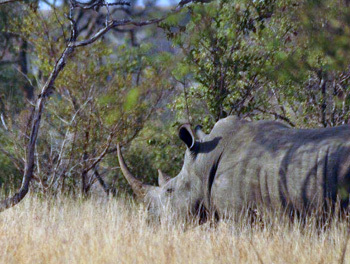 The rhino was busy grazing close to a bush. As we drove further on we saw elephants busy drinking water from a nearby reservoir. One of the elephants after drinking water pulled out a small tree with its front leg and trunk and casually threw it away. All the elephants left the watering hole following the matriarch. When we got to Sweni River there was a large herd of buffaloes. Some were busy taking a nap while some were drinking water from the river. Some were walking up and down. We went to Satara for lunch. After lunch we drove towards Olifants. One kilometre before the S127 we came across three cheetahs that had just killed a baby zebra. We spent quite some time on this sighting. The guests were very pleased to have seen three of the big five plus the beautiful three cheetahs. During another full day in the Park just as we entered the Orpen gate at 9am in the morning we came across a large herd of buffalos crossing the road. About 300m from the road a buffalo calf slipped and fell down. The mother did not bother to stop. The calf managed to get itself up and quickly followed its mother. Five hundred metres before the second gate a herd of elephants was walking towards the road about a hundred meters away. 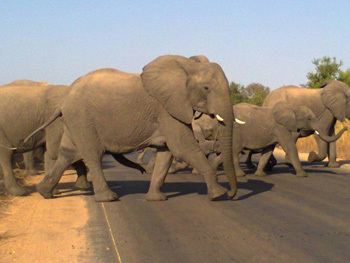 We waited for about ten minutes until the elephants finished crossing the road right in front of us. Two young males and one female came very close to our vehicle with their trunks and ears up. The guests were very excited and scared at the same time. Shortly thereafter we came across a pair mating lions. They only stood up once watching us then lay flat on the grass. We drove through the S39 to Timbavati Picnic spot. We had a good sighting of a leopard lying on the sand bank. There was a herd of elephants that were walking towards the leopard. The leopard got up and went into the bushes for safety. On our way back we came across the same pair of mating lions and this time they were closer to the road and more visible. On the last day of the month, I guided a full day safari into Kruger. We saw 4 of the big 5 excluding the leopard. The clients were disappointed. As we entered Marc’s Camp, guess what : there on the road , next to the swimming pool at the Adventure Camp was a big male leopard – very relaxed. My clients went wild !! While driving on Tshokwane road we spotted a leopard lying in a tree right alongside the road. Everyone in the vehicle was very excited. We viewed it for about an hour. Eventually the leopard came down from the tree and started stalking a Steenbok. The steenbok was not aware of the approaching predator and went on feeding on the grass. The leopard walked very slowly towards its prey. Unfortunately for him a squirrel noticed him and gave a warning sound. Immediately the steenbok stopped feeding and quickly looked around listening. The steenbok then ran away and the leopard lost his lunch. He did not give chase but simply turned back and went back up into the tree. As we drove further on we came across two male wildebeest fighting. They were head butting each other. There were some vultures that were close by that seemed to be enjoying the fight. There was a lot of dust all around. The fight seemed to go on and on. We eventually decided to leave and continue with our drive. While driving close to the Timbavati dry river bed we were happy to see a white rhino with a three month old calf. They were approximately seventy metres away from the road. The following day I went to Kruger for a full day safari with eight pax. On a day that started of with so many sightings of general game we were beginning to think that we were not going to have any luck with the cats. We were however greeted by a big herd of elephants that made us stop for a long time as they slowly made their way along the road. They had young babies and teenagers as well. As we proceeded the day got better. While driving near Nkaya pan along Tshokwane road we came across two male lions lying on the ground. Three buffaloes came close to the lions as they were going to drink some water. they paid no attention to the lions and went on with their own business. One of the lions stood up and looked at the buffalos and decided to go back to sleep. After a few seconds both lions stood up and the three buffalos ran away into the thick bushes. We continued further with our drive and we came across a breeding herd of elephants. It was very nice to see the big elephants walking with the baby elephants. We had to stop for a while as the elephants started crossing the road to the other side. Towards the end of the day we saw two cheetahs busy stalking some zebras. The moment the zebras saw the cheetahs they started to run away. One of the baby zebras slipped and fell down. The cheetahs got a hold of him and dragged the baby to some bushes that were about fifty metres. A day that had started so quietly with little action to speak of ended up with so much action that we were all excited beyond our expectations ! The Kruger has provided some excellent viewing this month, especially with regard to leopard sightings. The vegetation has died down, due to the lack of rain during the winter months; making spotting the big cats much easier. The first and possibly one of my favourite highlights involves three big male lions. The morning had starting off brilliantly with a big male leopard as our first sighting, so it would take something very special to top that, I guess our luck was truly in that day. While driving along the main Orpen road, I decided to give Sweni road a try, and it provided us with a scene straight from the national geographic channel. The ground was covered in vultures, the majority of which were white backed and two very rare white headed vultures. Three hyenas ran around pulling at bits of meat, while three large male lions sat in the shade with bellies filled with meat. My guests couldn’t believe their luck, as we watched the bushveld clean up team; finish off every last scrap of the carcass. The elusive leopard, so talented at hiding away, is one of the harder cats to spot. Luckily they do occasionally enjoy being the centre of attention. We had just arrived at the Kruger National Park gate, I was busy rolling up the canvas straps; when the man at the gate told us about a leopard sighting nearby. We zoomed through the gate and headed for the sighting, it didn’t take long before we noticed a vehicle with camera lenses pointing towards something in the bush nearby. It was a big male leopard, right there next to the road. As we sat watching the beautiful cat, it started to move closer to the vehicle and then decided to walk along the road in front of us. It was in no rush to run away; giving me and my guests a fantastic start to our day. The next highlight has to be taken by a family of white rhino . After lunch at Satara we headed off towards Timbavati. Along the way we made several stops for general game like giraffe , kudu and the beautiful zebra, what I way really hoping for were rhino. Just after stopping to view some vultures in the distance, I noticed three rocks, but the rocks starting moving and they had horns – it was of course rhino. It was mom dad and their young calf looking very relaxed grazing in an open clearing. A great sighting my guests were thrilled. 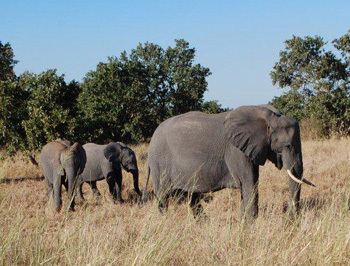 Balule reserve has provided me and my guests some exciting moments, the breeding herd of elephants have been moving through, providing some great viewing for my guests. 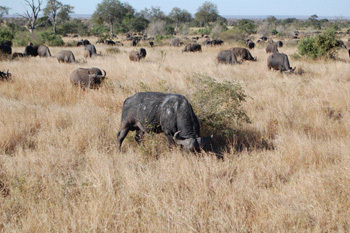 The large herds of buffalo have also been moving through the area in search of water. It was however the big cats that took first place in the highlights, first of which involved a three young lion cubs and two females in search of food. After a delicious dinner under the star filled sky, my guests and I headed back along the Olifants main road towards Tremisana lodge. With spot light in hand I was searching everywhere for eyes looking back at me and it didn’t take long before I picked up a shape in the road ahead. I sped up to get a closer look and it was a lioness followed by another lioness. They both turned around to have a look at us and then made their way into the thick bush – they looked like they were on a mission. We continued down the road with big smiles not expecting to see more lions so soon, but there walking along the road where three young cubs. What a great night’s viewing and so close to the vehicle my guests were very happy. The next big cat making the highlights was a leopard. We hadn’t got to far into the sunset drive so there was still a bit of light around, as the sun started to disappear; behind the Drakensberg mountains. We had just been to check a nearby water hole for any action, and managed to spot a small herd of kudu and a few waterbuck leaving the water hole. We continued driving along and with darkness starting to fall, I stopped to prepare the spot light. Just as I looked down to pick up the spot light I saw something moving in the bush to the side of me. I couldn’t quite make out the shape, until it moved out into the open in front of us; there it was a beautiful leopard strolling into the bush in front of us. The cold is the first greeting each morning this winter. This has not stopped us from embarking on the exciting bushwalks in Balule. On one bushwalk with Wesley and eight pax we came across Zulu the black rhino .We met Zulu on the river front just before we started doing the bushwalk. We parked the car next to Xirhomberobe lodge. I was busy giving the guests an introduction and Wesley came running. He was shouting that we should quickly get back into the car. I moved all the guests and we all managed to get back in to the car. Just as everyone settled in Zulu came charging towards the car. He started jumping from side to side in front of our car about ten metres away. I started shouting to scare him away. He stood in front of the car for about five minutes and eventually ran away. On African spruit we saw a big elephant bull drinking water. We stopped our vehicle and watched him for approximately fifteen minutes before he walked away. We continued with the spruit and we were very lucky. We found a black rhino with a small baby. On the western side of Shigamba dam on the Barnard property we saw seven lions comprising of six females and one male. The male was busy mating with one of the females. The guests were very happy and managed to get some good pictures. We did not stay at the sighting for too long because a lot of other vehicles started responding to the sighting. During the sunset drive on a very cold evening while driving on Olifants main road near the turnoff to Marula Boma we saw a leopard. The leopard was slowly walking on the road busy marking his territory for approximately ten minutes. This was a very good sighting because the leopard was right in front of our car and we were the only vehicle at that sighting. The elephants have recently started visiting the lodge frequently. Just outside the lodge and surrounds we saw Ezulwini the big elephant and his friends busy feeding. This scared and excited the guests at the same time. One guest even asked what if they get inside the lodge. “I will run away and lock myself in the room” she said. 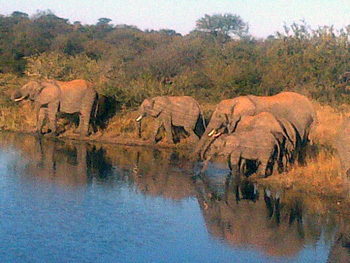 The elephants then went to the watering hole near the guesthouse to drink some water. We were then able to get into the vehicle and go for the afternoon drive. This month has been fantastic like so many before it, although the cold has crept up on us and left many of us looking like we’ve come from a south pole expedition, sightings in the bush have never been better with many days in Kruger leading to 4 out of 5 if not better! On this cold winter day there were four vehicles of us going into Kruger with a rather big yet very fun group. We set off early in the morning with very eager hearts and once again hoping to see whatever the bush had to offer. We arrived at Orpen gate and everyone had supplied themselves with enough water and snacks for the trip ahead. Shortly after entering the park we were stopped by an elderly gentlemen who informed us of a massive herd of buffalo not far up the road . Without hesitation we headed off in that direction hoping to maybe catch the end of the herd thinking it couldn’t be that big. On arriving where the herd was we were all shocked to find black heads as far as the eye could see and loads of tiny ones accompanied by their big male counterparts crossing the road mere metres away from us. The morning light allowed for some beautiful shots of these buffalo as they went about their early morning activity. After leaving the massive herd of buffalo not even 2km down the road I looked back in my rear view mirror to see flashing lights of one of our other vehicles trying to stop me. Immediately I stopped and turned around knowing something good was back there, and to my surprise there was a beautiful rhino bull who had just decided to show himself for a short time before he darted off back into the bush from whence he came. We carried on with the drive and got a few elephants here and there but one amongst them stood out to us all having only one tusk, not having broken the other but never having it grow in the first place which to all of us was something special to see. We left that beautiful bull and carried on only to once again have my guest yell “STOP!”, looking to my left I saw a beautiful female rhino with her almost adult calf walking beside her. They slowly but surely made their way to an open clearing before they too went off into the bush but just to have that small window to get some good photos was more than enough for all of us! This was an absolutely amazing day for both me and the guests unfortunately no cats but we all enjoyed it none the less . We left the park feeling rather privileged to have gotten to see so many rhinos. The cold might be here but the bush has never been more alive! Super exciting month once again with the arrival of a massive male lion moving into our concession. Ever since the death of ‘Big Boy’ our well renowned male lion, we have not seen a full mane lion moving through our concession but at the start of this month we got a pleasant surprise. Bush walks have always been the climax of my day and once again on this cold winter’s morning we got a pleasant surprise on the way to the Olifants River where we normally conduct our walks. Just as the we started to get some early morning light we picked up on fresh male lion tracks moving in a easterly direction parallel to us and followed up. At first we did not want to tell our guests, knowing that searching for these cats often leads to disappointment but today was our lucky day. It was barely five minutes after picking up his spoor that we found him calmly walking in the road! He was massive. We were privileged enough to have him all to ourselves for over ten minutes before he moved into the bush. We continued on to our walking site and had a very nice walk along the Olifants River with sightings of Hippopotamus, Crocodile and Waterbuck. By 3pm we normally forget that we in winter season due to the extreme heat and therefore I once again decided to start my afternoon drive heading straight for the river. On the way there we came across a breeding herd of elephants, not big in number but they definitely knew how to entertain. We firstly had a young bull elephant of about three months old come bursting into the road to see what this massive distraction was. At first he was a bit frightened but was easily calmed by the rest of the heard calmly feeding all around us. Once he got more comfortable with us he started gaining more interest in his trunk. It was hilarious. He was swinging it from side to side, up and down trying to work out how it works and what it does. Soon after he disappeared into the bush another young bull of about a year and half came into the road and started showing off his size and ability to trumpet. One of the guest were wondering if we were maybe not a little too close for him to react this way but if you looked all around us you could see the others were calm as can be. He was just putting into practice skills that he might need to use in the future as a fully matured bull. In the end they slowly moved on in a western direction and left us all in tears of laughter. The favourite of all my sightings was once again on an afternoon drive on the 12th of June. After finishing our Champagne breakfast, I stared talking about a massive Nile crocodile that we spotted whilst eating. One of my guest asked me if there was any penguins in the river? I obviously thought it was a rhetorical question and had a bit of a chuckle. I turned around and saw for only the fourth time in my life a Cape clawless Otter! It was amazing, not just seeing it but seeing what he was doing. He was swimming all around this island that the crocodile was resting on and then got on the island and started shuffling towards this huge crocodile. He went straight up to its tail and had a good go at him. Very brave man, until the crocodile gave a massive hiss and turned straight at him. This was the end of our spectacular sighting as he slid back into the river. The most interesting news comes from Jonno Beretta, Warden of Motlala Game Reserve of which Marc’s Camp forms a part. Jonno informs me that he has applied for a permit to keep lions on Motlala. He expects the lions to arrive within 3 months. We shall have to introduce a service whereby an armed ranger will accompany all our guests to their accommodation. We shall increase illumination especially around the tented area where guests use communal ablutions. We shall have to seriously consider fencing in the tented area. It is an exciting development as Marc’s Camp will now have 4 of the Big Five – I really hope that elephants are never introduced as they may really cause a huge amount of damage ! ( Pushing Treehouse and tree and client into the river – imagine ! ) Jonno assured me 10 years ago that we would never have elephants – let’s hope so. We will be adding mosquito nets to the beds. Although the windows have netting, mosquitoes may enter while our clients open the door. My advice is to keep the fan or airconditioner on (good idea in Summer when mosquitoes are more prevalent) as mosquitoes do not like air movement or cold. Janetta has suggested that we add aluminium and glass doors. She believes that we have such brilliant views of the river (now that she has arranged to have the bush cleared) that we are not doing justice to the treehouses. At the moment we do have windows that are fitted with roll-up canvas blinds. Because of the propensity of our monkeys to get into the treehouses in search of food, we added “burglar bars” made of wooden brandering. This does have the effect of minimising the view. I am not sure that glass and aluminium will necessarily fit in with the rustic bush décor. Perhaps if we paint the metal a dark brown – if anyone has any comments, please let me know. Our 2015 tariffs for overland safaris were emailed to you at the end of June. I believe that our products offer unbeatable value. Specifically the rates for single travellers are excellent insofar as the “add-on” rate is very little. I hope to finalise the Fly-in and Luxury Lodge safari tariffs by next month. We have had a number of school groups this month. They have been involved with outreach programs in the nearby Acornhoek district. It is very fulfilling to know that there are so many good and concerned young people out there who really care about the underprivileged. In fact I believe it is time For Viva Safaris to appoint a full-time person to co-ordinate all our outreach programs. Keep watching this space. This was my 2nd stay at Tremisana since 2012 and again it was an amazing time. After 7 hours drive from Johannesburg I arrived at Tremisana and was greeted warmly by Rai. After a quick drop off of my luggage I went on my first game drive. After a good drive we had our dinner at the Boma for a bush BBQ. Next day there was the bush walk but because of a knee surgery Rai changed my program without any problem so I could skip the walk. Each night I got my program for the next day and easily things could be changed and were done by Rai with a smile. I had some amazing good drives with Texan, Luke, Elvis. We had some incredible adventures of flat tyres and getting stuck in the sand but this part of the adventure. Being a female travelling alone I never had a feeling of insecurity. When I had to leave to my next stop it felt like I was leaving my family behind. This is feeling you get after a stay at Tremisana is that you have become a part of the Viva Safaris. Thanks to Rai for her energy each day and help with all changes, to Luke, Texan and Elvis for the amazing drives, to Delina, Caroline and the kitchen staff for the great meals each night. I hope I can return again to Tremisana so I can visit my Viva family again. I left South Africa with a lot of amazing memories and a piece of my heart left there. We are a group of nine that just returned from a volunteer safari that was beyond our wildest immagination. The lodging was rustic (no heat, air only at Tremisana) but comfortable. The food was simple but adequate (we all felt that the food at Marc’s Treehouse was even better than that at Tremisana) and the staff at both lodges were helpful. Our group especially enjoyed Margaret, Pretty and the staff at Marc’s. After four days the girls shed tears as we left. All of our guides were good. Bongani, our main guide was outstanding! While the animals that we saw were amazing, the experience of working with the children at Funjwa school and at the Ekurhuleni Center for Orphans and Vulnerable Children left us all humbled and so very thankful for having this experience. Thanks VIVA!! Thanks to Laurence of Ezulwini Lodges who hosted Sandra, myself and our friend Father Christopher Neville. Fr Chris said Mass on the deck and the entire staff of Ezulwini participated. I am one of the group of 9 from Texas USA who was with Viva Safaris in May. I thoroughly loved the whole experience!!! Please add me to the list to receive the newsletters. Somehow I never got on the list prior to our trip & I very much want to receive those newsletters. We had the time of our lives from all the amazing animal sightings to working with the children in Acornhoek. We enjoyed meeting all the staff from the wonderful knowledgeable guides (Bongani became part of our little travel family) to everyone at the lodges who cooked our meals & provided welcoming hospitality. (Margaret & her staff helped us celebrate 2 birthdays!) Every moment was memorable. Thank you! And please put me on newsletter list so I can continue to read about sightings & happenings until I can someday return. I would just like to congratulate you on your lovely newsletter and how wonderful it makes this previous guest feel about what is happening in and around the lodge and in the park specifically. Well done and I know how hard it is to write about your sightings and tours with such enthusiasm each and every month. Keep up the excellent work. You really are a world class safari company.